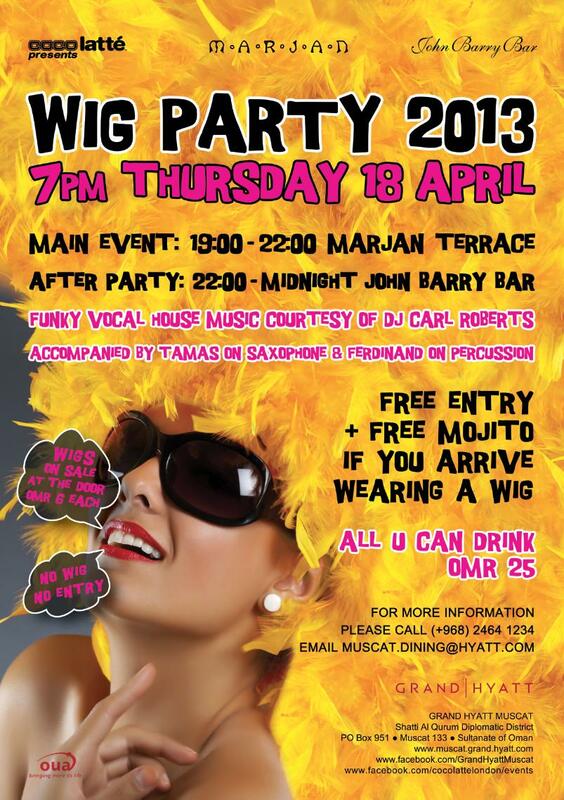 Next Thursday, 18th April at the Marjan at the Grand Hyatt (the restaurant by the swimming pool) there is a pretty great party planned: House music with unlimited drinks for RO 25, all you need is a wig, in Muscats first ever Wig party. I've seen a few wigs in Ramez, a few more in Daiso (mind you unless they restock I think they're gone pretty soon) and there's the opportunity to buy a wig on the door as well for RO 6. Here's the Facebook event page for more information. It kicks off at 7pm and runs till 10pm, before moving up to the John Barry bar for the after party which will run till midnight. Breathalysers needed that night !!! I love reative/costume parties. I never go to them of course. Omani girl conundrum (drinking/mixed) but I love the idea nonetheless. I'd go totally Marie Antoinette.